Although I had dabbled in “mindful practices” like yoga for several years, the first time that I became of aware of specific programs tailored to the specific needs of veterans suffering from PTSD and TBI was in October 2012. 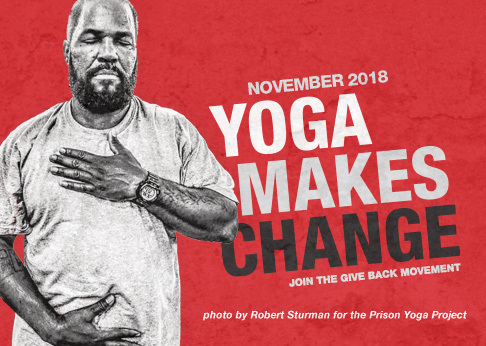 Having signed up for a three-day conference called Veterans, Trauma, and Treatment at the Omega Institute in Rhinebeck, NY, I happened to find myself seated across from Give Back Yoga founder Rob Schware during breakfast on the first morning. Mind you, there were hundreds of people in the dining hall, but – as these things go – it was “meant to be.” When I asked him about his sweatshirt, which had something to do with “Yoga for Veterans,” he said, “You’ll have to talk to Suzanne.” As the story goes, I never did get to meet this amazing woman – at least not at the conference – but I certainly would have plenty of opportunity to do so in the months to come: after all, her studio (Newington Yoga Center) is but a mere 5-minute drive from my house in central Connecticut! When I finally fulfilled my end of the bargain and showed up outside Newington Yoga on a cold, dark night in late February, I’ll be the first to admit: I was definitely…Nervous? Anxious? Apprehensive? Perhaps a little bit of all three. Am I going to be the only veteran here? (I wasn’t.) Are they going to “get it”—that I’ve got to be “facing the exit”… that I need to “see my out”… that I might end up bawling my eyes out? (They did.) Not to mention, either, that I didn’t even have a proper mat to use, nor money to buy one. As generous as she is, Suzanne not only lent me a mat, but promised me one of my own as long as I “came back.” Beyond that, she also gave me a copy of the Bhagavad Gita, a Hindu text I’d read years before but had since lost track of. Interestingly enough, it is the chronicle of an “epic battle” in which Lord Krishna instructs Prince Arjuna on all things related to human nature and spiritual development. So do I feel indebted to Rob, Suzanne, and all the other teachers who are “giving back” to veterans like me? Surely I do. But it is also goes well beyond being generous and opening their doors to me – although there is much to be said for all that as well. The fact remains, though, as I’ve already said… they “get it.” And as a veteran who has struggled for over eight years to not only find, but to trust, others who do, all I can say is that it’s like finding the diamond in the rough. Or, to use an analogy based on my renewed interest in the Bhagavad Gita, it’s like finding “peace” on field of Kurukshetra. And, whether the “war” we are referring to is “epic” or modern, finding peace… for a combat veteran…is worth more than diamonds. I, for one, should know.